It is safe to write that during my recent trip to California one of the last things I expected to see was an empty bottle of Hawaiian wine. There is a collection of old, empty bottles at the Taylor & Norton wine shop in Sonoma. 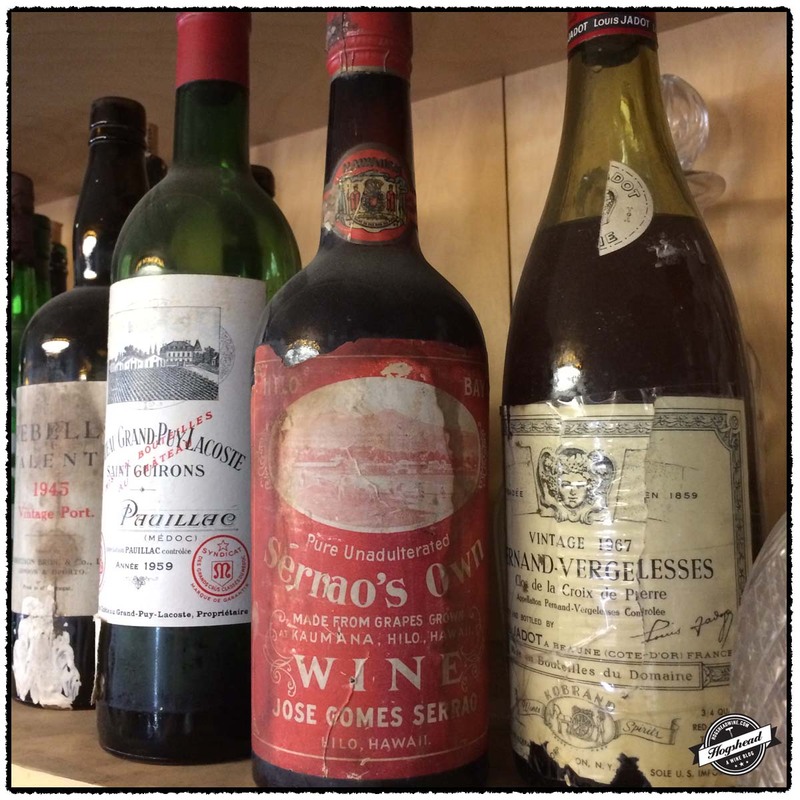 Standing next to 1945 Rebello Valente, Vintage Port and 1959 Chateau Grand Puy-Lacoste, Pauillac was the red labeled bottle of “Pure Unadulterated Serrao’s Own” from Jose Gomes Serrao. The label states the wine was “Made From Grapes Grown At Kaumana, Hilo, Hawaii”. This struck me as unusual. Thomas Pinney wrote that in 1937 there were two wineries licensed in Hawaii. In his footnote he continues, “Because neither Colorado nor Hawaii can have had any significant grape production, these operations presumably depended on grapes from California, if in fact they produced wine at all.” I did not find the report he specifically cites but another Federal report lists two bonded Hawaiian wineries as of July 1, 1943. These were the Serrao Wine & Liquor Co., Hilo and the K. Takitani Winery, Makawao. We know from recently published work that Jose Gomes Serrao cultivated the vine and produced wine on Hawaii from 1903 through Prohibition. In this post I briefly describe the origins of Hawaiian winemaking along with the efforts of Jose Gomes Serrao which parallel those of the Hawaii Agricultural Experiment Station. The cultivation of the grapevine in Hawaii dates back to March 4, 1792, when Captain George Vancouver left grapevines, orange trees, and garden seeds. In 1815 Don Francisco de Paul Marin, also known as “Marini” or “Manini”, planted a vineyard for the king. He reported that he made 38 gallons of wine but it is not stated whether this was from his vines or those left by Vancouver. On January 26, 1819, Camille de Roquefeuil reported that Don Francisco Marina “makes a fairly decent wine from vines he brought from California.” On April 17, 1822, Reverend Daniel Tyerman visited “M. Manine, a Spaniard”. Here he found three acres laid out with a garden, vineyard, and orchard. The vines were “trained after the Spanish fashion in bushes, flourish luxuriantly.” The vineyard was located on “the slope of a beautiful hill” at the foot was a small river. Reverend Tyerman was informed they were bear fruit three times per year but the third was prevented, “least it should too much exhaust the stocks.” Jacques Arago found the grapes “excellent”. One report from a few years later indicates that Don Marin had “cultivated the vine so successfully as to have made tolerable wine”. Charles Samuel Stewart found that a “considerable quantity of wine is yearly made from his vineyard.” The site of Don Francisco Marina’s vineyard was locally known as “ka pa Waina”. It appears this is a literal translation of the English vineyard. Don Marin continued to cultivate the vine and produce wine until the early 1830s. Today the location of his vineyard is commemorated by Vineyard Street. 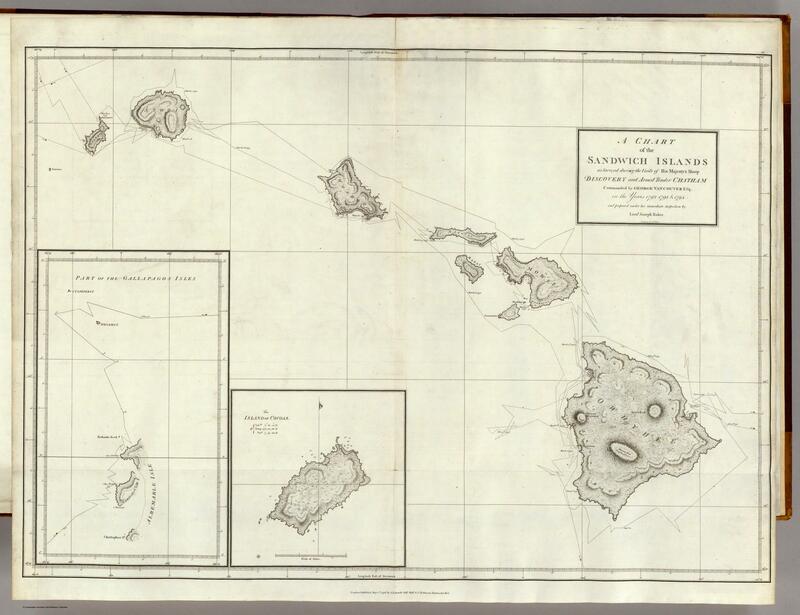 Chart of the Sandwich Islands. Vancouver, George. 1798. David Rumsey Map Collection. The Hawaii Agricultural Experiment Station was funded by Congress and established in 1901. An experimental vineyard was planted the following year in 1902. In March 1906, a cooperative experimental vineyard was planted on Maui. This vineyard contained 175 different varieties of “wine grapes” and was overseen by Portuguese settlers. These cooperative experiments with private growers continued for years. It was anticipated that an influx of immigrants from Spain, Portugal, and the Azores would make grape growing and winemaking profitable. 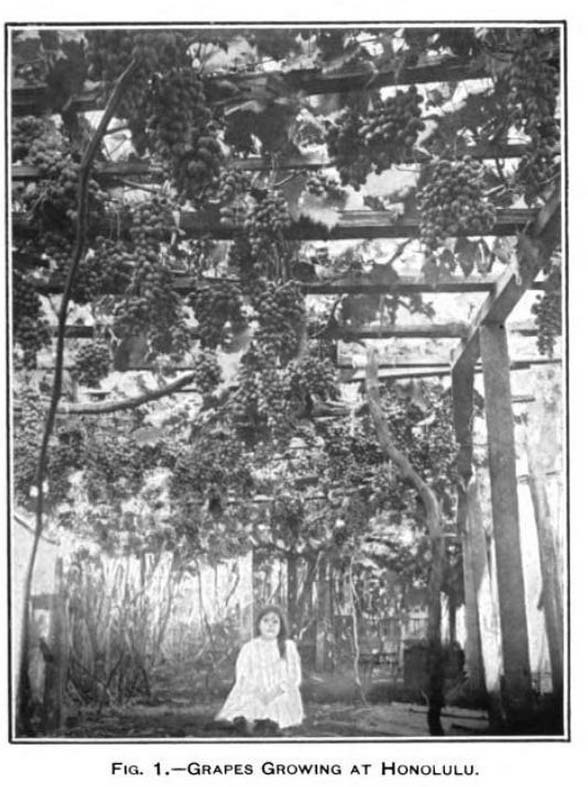 [picture of grapes] By 1915 it was acknowledged that a particular clone of the Isbella vine, brought by the Portuguese from Madeira, showed the greatest success. Small vineyards were to be found near Honolulu, Hilo, Kona, Makawai, and the lower slopes of Haleakala. The vineyards located closest to cities typically provided table grapes. Wine was made at several locations, presumably using the Isabella grape. Apparently it was “necessary to fortify it heavily to prevent deterioration.”[picture] In addition to determining the grape varieties ideally suited to the islands the station investigated trellising, pruning, and fertilizing. Jose Gomes Serrao also advertised his “Serrao Liquor Company” throughout the years in Our Navy published by the U.S. Navy. One advertisement from 1910 notes amongst other drinks “Pure Kaumana Wine, ‘Serrao’s own’ made from Kaumana (Hawaaiian) Grapes.” His ventures must have been successful for his company helped fund a laboratory near the “Volcano House” for use by the Massachusetts Institute of Technology. By 1913 Jose Gomes Serrao was repeatedly listed as “the wine expert of Hilo” and that “Kaumana Wine is a product of the ‘Big Island’ and is absolutely pure.” In September 1916, Jose Gomes Serrao exhibited at the Second Annual County Fair of the Big Island. He displayed his Kaumana wine in kegs and bottles. There was also a realistic arbor of grape vines. Just several years later, the enactment of Prohibition effectively ended his success in wine production. When wine production was eventually resurrected by his sons, the shipping restrictions during World War II forced the final closure. Pinney, Thomas. A History of Wine in America: From Prohibition to the Present. Liquor industry. Hearings before a subcommittee of the Committee on the judiciary, United States Senate, Seventy-eight Congress, first session, on S. res. 206. 1944. Hathi Trust Digital Library. Evening bulletin., November 17, 1909, 3:30 EDITION, Page 7, Image 7. Honolulu. Library of Congress. Evening bulletin., November 22, 1909, 3:30 EDITION, Page 8, Image 8. Honolulu. Library of Congress. U.S. Navy. Our Navy, Volume IV, No 7. November 1910. Hathi Trust Digital Library. Report of the Hawaiian Volcano Observatory of the Massachusetts Institute of Technology and the Hawaiian Volcano Research Association. 1917. Hathi Trust Digital Library. The Maui news., September 06, 1913, Page 6, Image 6. Wailuku. Library of Congress. The Hawaiian gazette., September 29, 1916, Page 6, Image 6. Honolulu. Library of Congress.